Every year when we take down the Christmas tree and decorations at our home, my thoughts turn immediately to Valentine’s Day. Not that I’m a huge fan of Valentine’s Day or need another holiday to look forward to. And certainly not because I want to decorate the house again. But when we were kids, my Dad for several years decided that we didn’t need to buy a Christmas tree. Instead, he dug up a tree from the backyard and potted it. It sat in our living room until spring when the Wisconsin ground was thawed enough that it was safe (and possible) to re-plant the tree again. Anyway, since we lived with a Christmas tree in the living room for about six months of every year, we needed to do something with it. So one year my mom sewed up a bunch of cute stuffed hearts on ribbons and hung them from the branches of the tree. And now every year I remember those hearts when we take down our own Christmas tree. 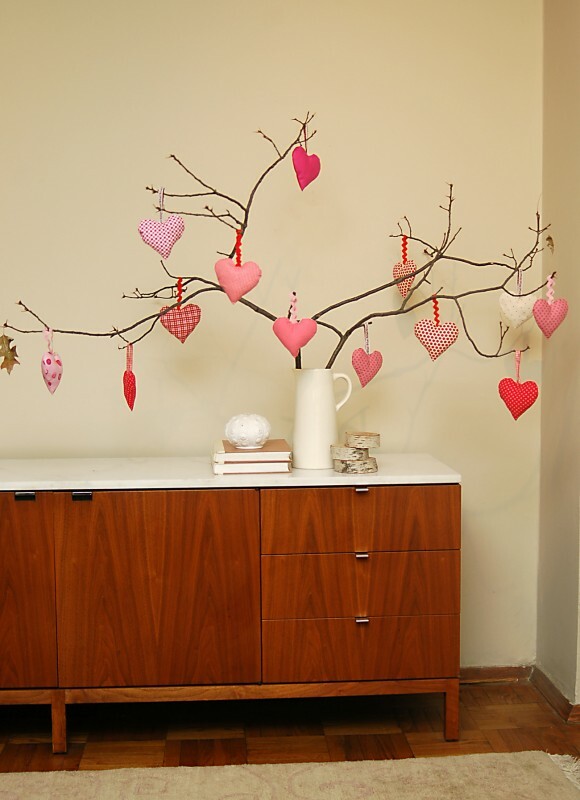 So this year I thought it would be fun to make our own heart tree, but not by keeping up our Christmas tree. (I can hardly wait to get rid of it every January; it takes up so much space in our tiny apartment!) I made a number of hearts and hung them from a few branches I found on the ground outside. 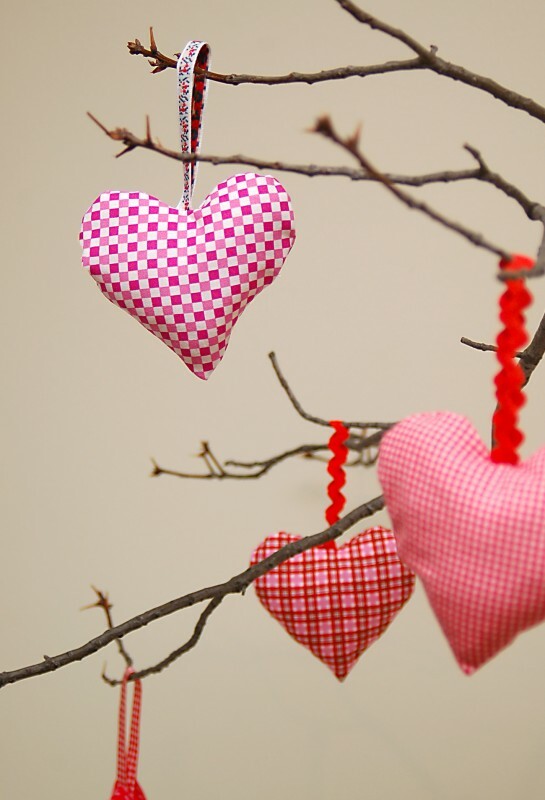 Want to make your own Valentine’s Day heart ornaments? They’re quick and easy when you download and use our newest free pattern, which you can find here. I can’t wait to see what you do with your own hearts. What a beautiful story! What a great idea to dress up the mantle. very cute and well done!!!! Thank you for sharing this pattern! 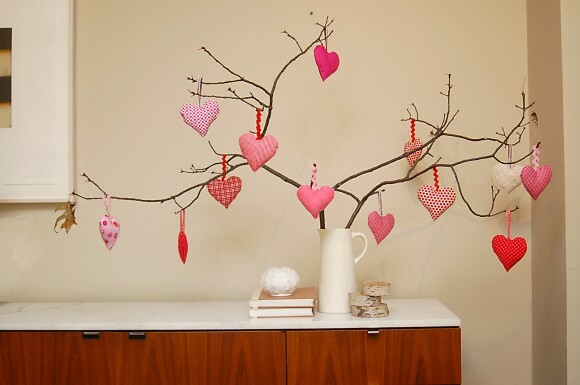 I’ll be decorating my mantle this year with a Valentine’s Day tree!! What a really, really wonderful storyteller you are. Thanks also for the terrific, free pattern! I want to hear the end of the pruning story! Hi, I looooved your tree and free pattern, thank you so much. I was looking for some creative idea to use branches and here it was. Absolutely adorable. You inspired me, so I just made one myself and used your pattern for cutting hearts out. I wish I could share picture of my finished project here. Mine is little bigger and I painted branches white :)) Thanks again!! Your memory is so funny! Why did your dad’s hat have “Stupid” on it? 🙂 I believe more pruning stories are in order. Thanks for the tutorial…I ma in the process of making hearts right now and wil be out looking for branches this afternoon.